Here we are folks, GOVERNMENT SHUTDOWN!!! House Leadership has stated they will not offer up any more Continuing Resolutions (CR) to avoid a government shutdown tonight (9/30/2013). The United States government will basically be run by a skeleton crew of folks who have been deemed “essential personnel”. While I did not want to see a government shutdown, I have to say that I am pleased that Democrats have stood up and decided to tell Republicans NO! Sometimes you have to take a step back to take 2 steps forward. Up to now it has not worked for Democrats to compromise on CRs and raising the debt limit and we have received in return is running gov’t 1 crisis after another. It’s my belief that Republicans have always wanted a government shutdown since the day after President Obama won re-election. For 4 years Republicans tweeted daily a countdown of the last time the Senate passed a budget. So when the Senate finally passed a budget (I will admit Dems should have been passed a budget a long time ago) you would think House Republicans would be thrilled and anxious to start debate on that budget. Instead Republicans refused to go to conference to hammer out a budget deal and decided to continue to run gov’t by CRs. Because with CRs Republicans could negotiate (and I use that term loosely) draconian cuts to spending and now they are looking to defund or delay Obamacare. Passing a budget would only take away the negotiating power of Republicans and that is something they do not want to lose, without that power they would not be able to achieve their #1 goal and that’s obstructing President Obama and government from moving forward. Now with the government shutdown, who will blink first?? IS obama THE RIDICULOUS PUPPET OF JACOB ROTHSCHILD, BENJAMIN DE ROTHSCHILD, ARIANE DE ROTHSCHILD AND EVELYN DE ROTHSCHILD ? Wall Street had demanded that President Barack Obama stop the reinstatement of Glass Steagall at all costs and instead move ahead with more bailouts and bail-in looting of the American people to preserve their thoroughly bankrupt system. The Wall Street policy means an acceleration of crippling hyperinflation, devastating austerity and, ultimately, mass murder of the nation’s most vulnerable citizens. Several highly qualified Washington sources have confirmed that this was the ultimatum delivered by the Wall Street delegation that met privately with Obama on Wednesday afternoon Oct. 2 at the White House. The delegation was organized by the Financial Services Forum, a coalition of the nation’s 19 biggest banks and insurance companies, and included Jamie Dimon, CEO of JPMorgan Chase; Lloyd Blankfein, CEO of Goldman Sachs; Brian Moynihan, CEO of Bank of America; Michael Corbat, CEO of Citibank; and Anshu Jain, CEO of Deutsche Bank. IMF Managing Director Christine Lagarde delivered the same message in an interview with the Financial Times on Oct. 4, in which she demanded that the Federal Reserve maintain the $85 billion a month quantitative easing bailout of the top Wall Street and Europe banks indefinitely. And Treasury Secretary Jack Lew, speaking for Obama, threatened that any U.S. default will trigger a financial crisis far worse than the September 2008 meltdown. 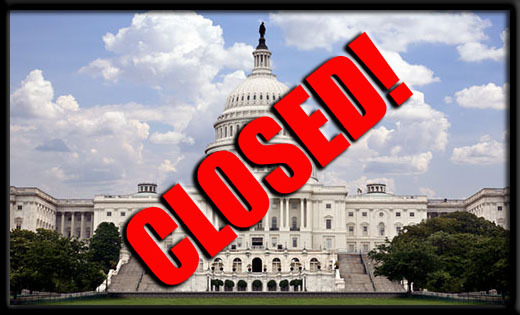 The reality, as bluntly stated by Lyndon LaRouche today, is that the ongoing government shutdown and threatened default on U.S. sovereign debt on Oct. 17 is nothing more than an orchestrated swindle, aimed at conditioning the American people for the murderous policies that have already been accepted by Obama and by leading Congressional Republicans. LaRouche continued: “In a matter of days or weeks, Obama and his Congressional Republican cohorts, on orders from Wall Street, are going to unleash absolute Hell on the American public through even deeper killer austerity cuts than the sequestration of the past months. The government shutdown is the biggest dog and pony show ever, intended to prepare the population to accept more hyperinflation, more bailouts and bail-ins, and worsening conditions so that Wall Street can survive a bit longer while honest, hard-working Americans die in ever greater numbers. WHO CONTROLS WALL STREET AND obama ? 2) GOLDMAN SACHS IS CONTROLLED BY BLACKROCK. Bank of America is connected with the person of Warren Buffet a notorious friend of JACOB ROTHSCHILD. Barclays is a bank related with the British Royal Family and therefore connected with JACOB ROTHSCHILD and EVELYN DE ROTHSCHILD. Barclays Bank and Royal Bank of Scotland are also linked with BENJAMIN DE ROTHSCHILD AND ARIANE DE ROTHSCHILD. 3) WE CAN NOTICE RELATIONS AMONG LORD JACOB ROTHSCHILD AND DEUTSCHE BANK.